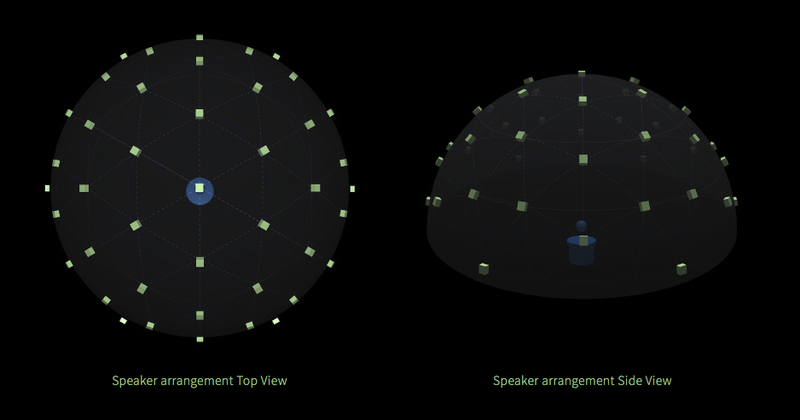 Placing 47 speakers (43.4 ch) in a dome shape, Creating 3D sounds designed and arranged by ZIRKONIUM, which is a dedicated application that makes it possible to control algorithms for that multi-speaker group. Placement, flow, movement, etc. of the sound intended by composer, it is a 3-dimensional surround audio system that realizes them as expected. The Klangdom Sound System created by advanced research by ZKM with dedicated application Zirkonium and multitrack control system sound flow that completely synchronized with the motion of the image, multilayer surround effect etc. Enveloped by the flow of sound flowing in and out of the dome space it is a 3D sound system that realizes an experience like swimming in as shining brilliant sounds as a planetarium sound system. Lei Connection Inc., as the project manager, created the Klangdom Sound System and the planetarium program compatible with this system, "Starry Journey in FRANCE" (2017.11-2018.09). The English notation of "klangdom (German notation)" is "sound dome". In February 2017, stayed for 1 month at ZKM's IMA (the former Institute for Music and Acoustics, now Hertz-Lab) of Karlsruhe, Germany, as a guest artist of ZKM under the mission of the Klangdom for Konica Minolta Planetarium "Tenku". ZKM is a research institution that is conducting cutting-edge researches worldwide in the field of 3D sound. In order to introduce that technology into the sound system of the planetarium of Japan, I exchanged opinions with ZKM researchers in every aspect, such as architectural acoustics, software and composition necessary. In November 2017, Konica Minolta Planetarium “TENKU” adopted the Klnagdom , as a new sound system. The purpose of this visit was to report the completion of the project to Prof. Ludger Brummer, ZKM IMA Director. He was very pleased with the completion of the project and he highly appreciated the fact that Konica Minolta Planetarium Corporation, a Japanese private company, has permanently introduced "Sound Dome®". This can be said to be a great step forward in 3D sound systems in Japan. Left: Institute for Sound & Music, Chairman, Artistic Director, Nick Meehan. Right: Institute for Sound & Music, Press Relations, Mea Liedl. 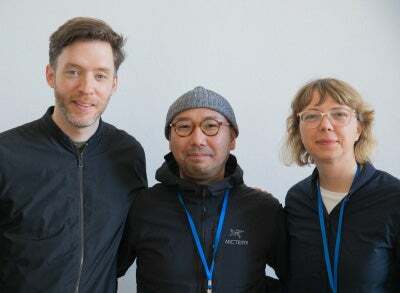 Center: Sound Architect, Oguro Junichi. Photo: Oono Shinjiro. This 360 degree AUDIOVISUAL Exhibition was created by ISM (Institute Sound & Music Berlin). The exhibition presents surround video and stereophonic artistic works consisting of a 52-channel Klangdom, a 3D sound system developed by ZKM, paired with six large rear projection screens and laser projectors. The opening of the exhibition welcomed an extraordinary piece by world renowned artist Brian Eno. During the exhibition period, artists such as Radiohead’s Thom Yorke were commissioned for the ISM HEXADOME to perform and create installations with 3D sounds. Holly Herndon, a young and highly focused artist, performed a special live performance using this exhibition space during the tour. While the advance sale tickets were sold out, I felt that the conceptual live using the reverberation space of the museum and Klangdom was wonderful and leads to the idea of a new way of using 3D sound. I am strongly aware of the possibility of the future 3D sound system as a result of the fact that a lot of skilled artists are involved in exhibitions like this HEXADOME. And Klangdom in Japan further felt that it was inevitable that it would become the necessary acoustic system for the future era. 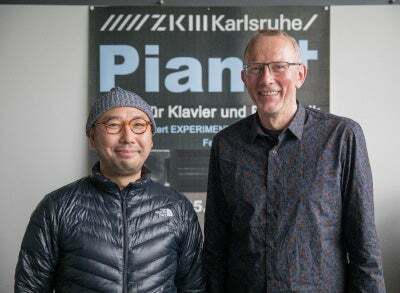 We believe that a wide range of developments in the future in collaboration with ZKM and ISM will broaden the base of Japanese 3D sound. Born in Sapporo, 1974. Sound artist who extends the music domain. Beginning to compose from childhood and winning the national Grand Prix at domestic composing contest. In 2006 he traveled to Berlin and was involved in a wide range of composing activities from commercial music such as overseas commercials to acoustic space designs throughout Europe while being involved in projects at the Beijing Olympics and pavilion music at the Shanghai World Expo. While doing field recordings in various countries around the world, he also works on acoustic architectural projects as a sound architect in the field of 3D sound, and as a guest artist at ZKM in Germany. 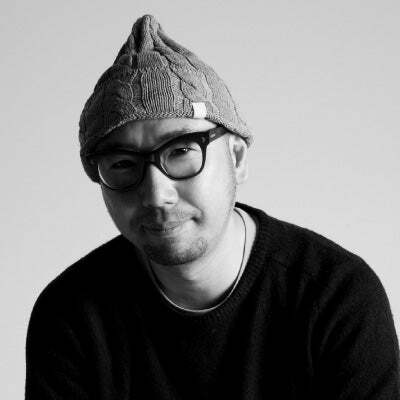 In contemporary art, he is presenting sound art works that visualize sounds both in Japan and abroad, and he presides the experimental sound and ambient label "43 d" established for outputting advanced sounds. Composer and visual artist Brian Eno returned to Berlin this week for the opening of his audio-visual installation, “Empty Formalism,” at the Martin Gropius Bau. Within the framework of the INTERFACES project, co-funded by the Creative Europe Programme of the European Union, the festival »inSonic2017: Immersive Future« took place at the ZKM.